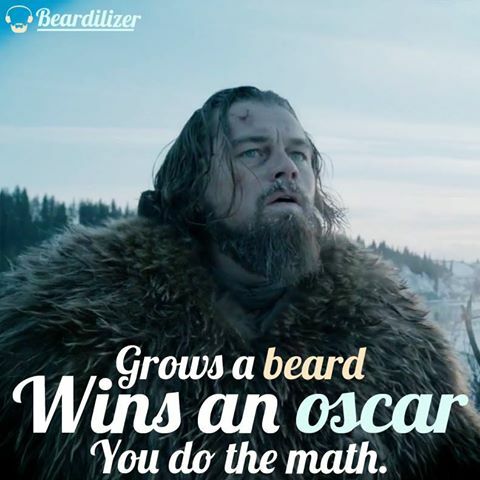 The Oscars this year changed history, beardy history. After years and years of being denied an award, Leonardo DiCaprio finally brought home a golden statute. While some film critics argue that it was based off of his alleged “talent” it’s safe to say that one thing brought home the bacon; the gnarly beard that he grew for the role. While Leo had been beloved by the ladies (for whatever reason) his prior nominations show that the mediocre facial hair he wore wasn’t enough for the Gods of the Theatre to give him any statues. Looking at other Oscar wins (and losses) it’s pretty clear that the Academy favors the bearded ones. This past year may have been one of the blandest Oscars to date with a serious lack of diversity, especially bearded diversity. Two beards were involved this year! Only two! Leo’s beard and the luscious beard of Poe, err, rather Oscar Isaac in Ex Machina. The sci-fi hit cleaned up because of some unforeseen force and propelled Isaac into instant beardo fame. Beardilizer will always appreciate a beard fandom cross over, by the way. Star Wars is chock full of beards AND awards. Speaking of additional awards (and losers) another Beardilizer hero cleaned up, many, many years ago. The power of this man’s beard lives on as part of his hilarious legacy. Who could this amazing actor be? The one and only Robin Williams! His beard in Good Will Hunting brought the role of Oliver Sacks to life. While Ben Affleck won an award for the writing of the original screenplay, please note that Affleck has been denied awards of further magnitude. What could be wrong? No beard, that’s what is wrong. One could argue that even Jared Leto fell into the good graces of the Academy since he showed up to the Oscars with a baby beard. Yes, the man might need to take some supplements to help that little beard of his fill out. Christian Bale grew a ginger beard for some of his roles and his continued success as an actor overshadows his ability to have meltdowns on set. Beardilizer doesn’t forget, bro. Grow a beard and calm down! It doesn’t take a rocket scientist or even playing one in a movie to see that fortune favors the bearded. Hollywood’s recipe for success given that all of these award winners have beautiful, resplendent manes is pretty transparent. Grow a beard, get an Oscar. It’s pretty obvious that even Leo looked into how to ‘winterize’ his beard. Keeping your beard in fighting shape, even if you’re on a movie set should come first. The last thing that any makeup artist wants is telling you that you have to trim you beard since the breakage from the cold is so bad. Beardos cannot fight a bear and live to tell the tale if they are not prepared for such an occasion. Throw on some wax, look at yourself in the mirror and get your camera crew. It’s Oscar time!